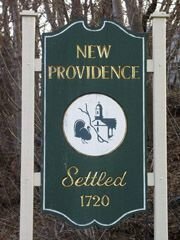 First settled in 1736, the Borough of New Providence grew to a population of 12,426 by 1980; then declined to 12,178 by 1987 and 11,793 by 1999. The Borough, created by an act of legislature in 1899, covers 3.6 square miles and is located between the first and second Watchung ridges in the northwest portion of Union County. It is considered to be a part of the New York-North Jersey Urbanized Area. As the community grew, so did the schools, developing from one four-room schoolhouse constructed in 1907 to five buildings in 1971. The district reached a peak enrollment of 3,840 in 1970. Through the 1980"s decade the upward trend reversed itself, and student population declined steadily. Two schools were closed leaving two elementary buildings, which currently house grades K - 6 and a high school serving grades 9 - 12. Beginning in September, 1991, a middle school, formerly located in each elementary school, was initiated in a separate wing of the high school building.